Generac's 6854 HomeLink Upgradeable Manual Transfer Switch is a pre-wired electrical device that's installed next to your home's circuit panel. During an outage, it delivers power to hard-wired appliances (such as furnace, well pump and lights) with the push of a button, safely and easily eliminating the need for multiple extension cords. It comes standard with 8 circuits, expandable to 10 circuits. When you're ready to install an automatic home standby generator, a certified electrician will change out the panel located in the HomeLink with an automatic switch upgrade panel and new faceplate and it's ready to be connected to a home standby generator (11 kW maximum). Conceal cables and power for your wall mounted TV Model 2-CK in-wall power and cable management system. Designed to simplify wiring behind wall-mounted flat-panel TV's. This discreet system allows audio video cables and cords to be routed through the wall for a clean look. Code Compliant to install power includes hardware and helpful mounting template makes the this the perfect do-it-yourself solution for any skill level, without the need for an electrician. No wiring, simple snap together power connectors make this easy to self-install. Conceal cables and power for your wall mounted TV Introducing model ONE-CK in-wall power and cable management system. Single-Gang size all-in-one design. Designed to simplify wiring behind wall-mounted flat-panel TV's Pre assembled discreet system allows LowVage cables and wires to be routed through the wall for a clean look. Code Compliant to install power, includes hardware and helpful mounting template make the ONE-CK the perfect do-it-yourself solution for any skill level, without the need for an electrician. No wiring, simple snap together Power Connectors make this safe and easy. 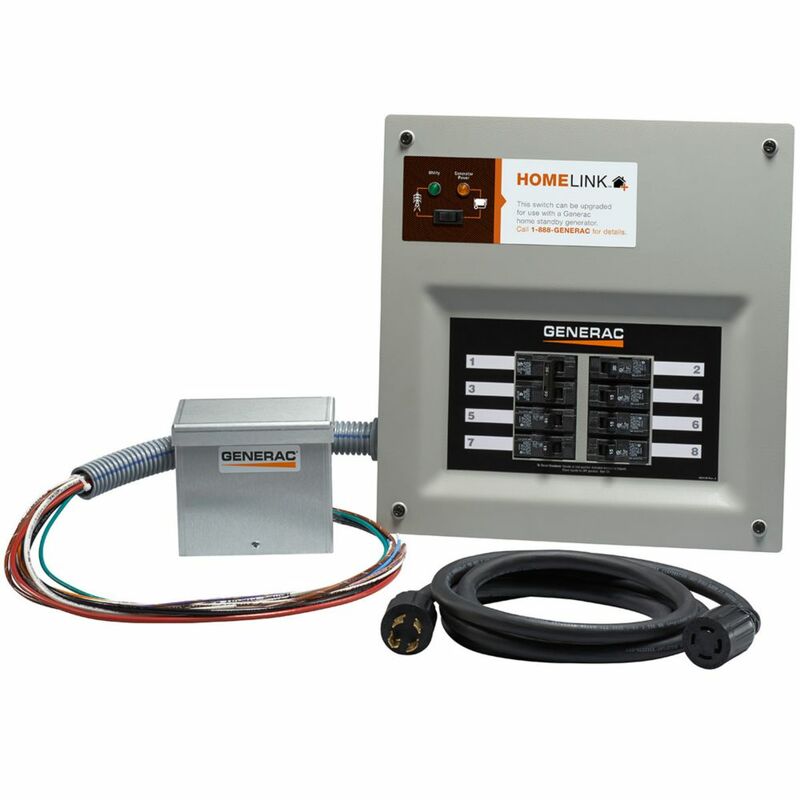 Homelink Manual Transfer Switch 30 amp 6-8 circuit kit Generac's 6854 HomeLink Upgradeable Manual Transfer Switch is a pre-wired electrical device that's installed next to your home's circuit panel. During an outage, it delivers power to hard-wired appliances (such as furnace, well pump and lights) with the push of a button, safely and easily eliminating the need for multiple extension cords. It comes standard with 8 circuits, expandable to 10 circuits. When you're ready to install an automatic home standby generator, a certified electrician will change out the panel located in the HomeLink with an automatic switch upgrade panel and new faceplate and it's ready to be connected to a home standby generator (11 kW maximum). Homelink Manual Transfer Switch 30 amp 6-8 circuit kit is rated 4.8 out of 5 by 5. Rated 5 out of 5 by Tree Biscuit from Did the trick I purchased this unit because I have a shop that is a distance from the house. It was not economical to run a separate line from the house standby to operate the shop equipment during power outages. The Homelink panel wired in neat and cleanly to the shop main panel, and works as it should. Loved that except for a length of cable to connect the outside generator box to the transfer switch, it all comes in one box. Highly recommend it. Rated 4 out of 5 by Paula from Instructions left a lot to be desired. Who writes these... Instructions left a lot to be desired. Who writes these anyway? Utube is not much better. Rated 5 out of 5 by Homeowner from Easy project Easy to install. Strait forward instructions and testing procedures. Works great!